HBO shared a short teaser for season seven of Game Of Thrones back in March, but if that glimpse of your old Westeros friends was too brief—and too lacking in new footage—the premium cable network has now released a handful of photos showing what Daenerys, Sansa, Cersei, and the rest are up to these days. The images don’t offer much in the way of actual information about what will happen in the upcoming episodes, but a good chunk of the returning characters are wearing stylish, new outfits at least. That means it’s less of a tease for season seven than it is a tease for the next batch of Funko Pop! figures you’ll have to buy, but it’s better than nothing. The photos come from Entertainment Weekly, and you can see the full set—along with some helpful commentary—below. 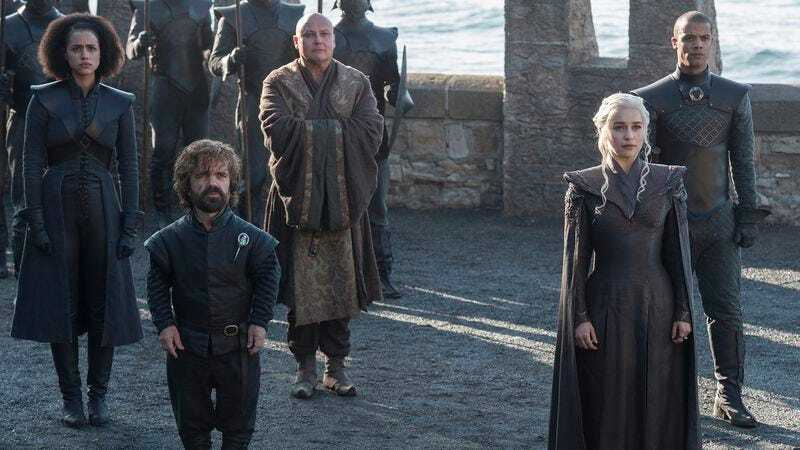 Here’s Daenerys showing off her cool cape alongside her squad. You’ll notice that she’s not on a boat, so this is probably happening somewhere in Westeros. This is Arya, intently listening to something while blurry men drink behind her. Hodor is no longer with us, so it falls on Meera to drag Bran through the snow now. Samwell in the background finally has some new clothes, and Gilly is getting some reading in. Maybe she’s reading The Winds Of Winter? Davos has a sturdy goblet, which is the sort of amenity you get when you throw your support behind Jon Snow. Everybody’s favorite romantic subplot will be back in season seven, with Tormund Giantsbane once again putting some moves on Brienne. Sansa and Littlefinger are probably talking about the last time they were at Winterfell together, when he forced her to marry that abusive creep Ramsay. The Lannisters don’t seem to be enjoying their reign a whole lot. Sandor looks pissed about something, but he’s always pissed about something. Jon Snow looks slightly out of his depth, but he’s always slightly out of his depth. Lyanna Mormont looks like a boss, but she always looks like a boss. Daenerys always gets the coolest dragon-themed accessories. We can’t think of anything interesting to say about Varys. Missandei also gets cool dragon-themed accessories. Finally, here’s Tyrion looking slightly different than he did in the earlier photo.